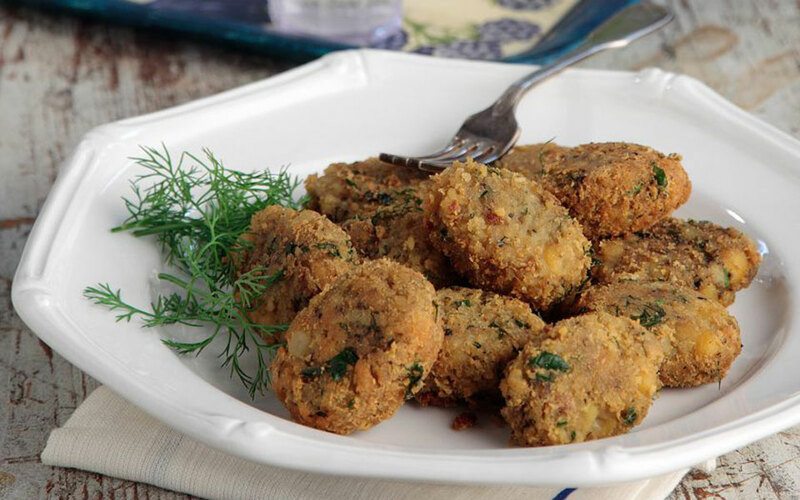 All over Greece, fresh summer vegetables are turned into golden, crisp keftedes. Here are three recipes we love. While fried food is definitely heavy, and heavy foods are generally associated with winter, in Greece most fried foods are typically summer dishes. From spring until fall, stews and oven roasted meats are switched out for crispy veggies and seafood, often sprinkled very generously with salt at the table, to satisfy heat-induced sodium cravings. Everyone loves the rustic, thick-cut Greek fries, but there’s a lot more to discover. Fried veggies in beer batter are delicious, as are the local meatballs, which are fried with or without a coating of flour to make them extra crisp. Aside from meatballs, or keftedakia (small patties/fritters) in Greek, there are plenty of other keftedes (patties/fritters) to try. Most of them are vegetarian, while a few are made with seafood. Below are three recipes for vegetarian fritters we love. 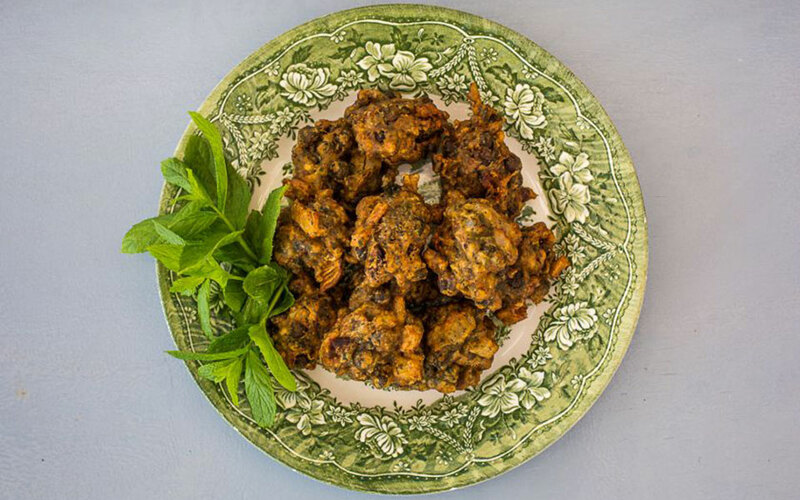 Kolokithokeftedes (zucchini fritters) is not just one of the hardest words you’ll ever come across in a taverna menu, but also one you’ll want to learn, because these fritters are delicious. Crisp on the outside, soft in the middle, with fresh herbs and zucchini for fresh, summer flavor, they’re often served with tzatziki. Grate the zucchini and place it in a fine sieve. Mix the zucchini with salt, and let it sit for 15-20 minutes. Squeeze to remove as much liquid as possible. Add the zucchini, feta cheese, flour, herbs, eggs, and a little bit of salt (remember that the feta cheese is also salty) and pepper to a large bowl, and mix gently. If the batter is too sticky to be shaped, add a little bit more flour. Shape the batter into small patties or balls, the size of walnuts, and cover them completely in a light layer of flour. Heat up olive oil in a non-stick pan over medium-high heat (it should reach 170° – 180° C). The oil should reach about 30 mm up the sides of the pan, as the fritters should be deep-fried. Add about 7-8 patties to the pan at a time, and fry for about 4-5 minutes, turning them as needed, until golden. Remove with a slotted spoon and place on paper towels to drain off excess oil. 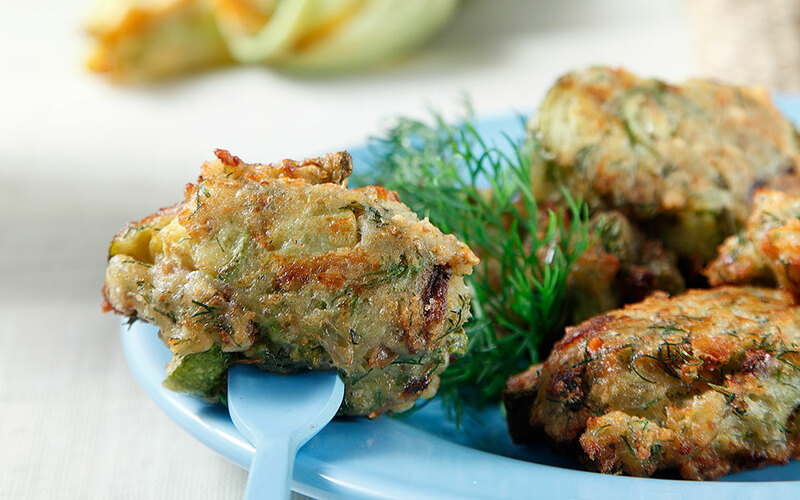 Serve your zucchini fritters with tzatziki made with strained Greek yogurt. This recipe by Niki Chrysanthidou was first published in Greek here. 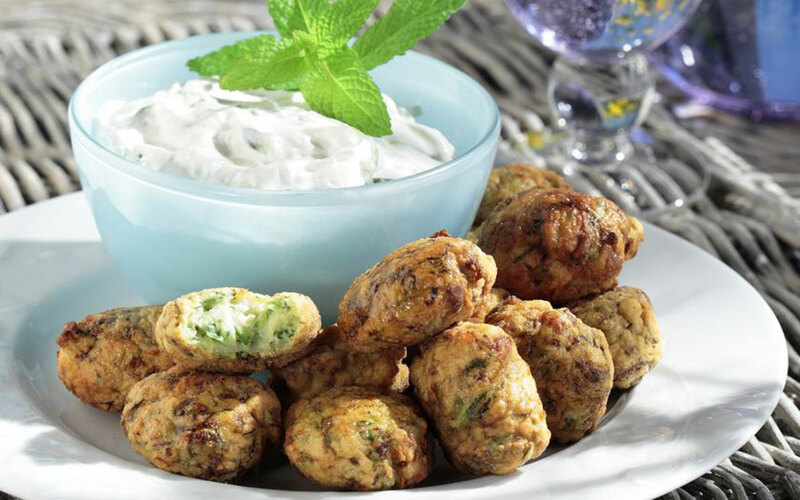 Not as famous as their Middle Eastern cousins, the falafel, Greek revithokeftedes (chickpea fritters)are served on their own, rather than in a wrap. This recipe from the island of Sifnos is quite time consuming, but it’s worth it in the end. Rinse the chickpeas and rub them to remove the thick skins. Rinse again, and then pour them into a pot with cold water. Bring to a boil over high heat. Lower the heat and let the chickpeas simmer until tender, removing foam as needed. Add the oil, onion and salt, and continue to simmer until the chickpeas and onion are very soft. Strain and puree with a food mill. In a large bowl, mix the pureed chickpeas with flour, mint, garlic, and spices. Let the batter cool. Shape the batter into small patties or balls (if the batter is too sticky to shape, add up to three tablespoons of breadcrumbs), and cover them completely in a light layer of flour. Fry in olive oil until golden. Remove with a slotted spoon and place on paper towels to drain off excess oil. This recipe by Dina Nikolaou was first published in Greek here. For traditional Santorinian domatokeftedes (tomato fritters) made with cherry tomatoes, check out Michalis Nourouglou’s recipe here. This recipe from Kimolos is a little bit different, using sundried tomatoes in place of fresh. Stir together all the ingredients in a large bowl. While continuously stirring, slowly add water until you have a smooth, thick paste. Let the batter rest for 30 minutes. Heat olive oil in a pan over high heat (the oild should reach about 2/3 up the sides of the pan). Place spoonfuls of the batter into the oil, and fry for about 2 minutes on each side, until dark golden. Remove the tomato fritters with a slotted spoon and place them on paper towels to drain off excess oil. This recipe by Vaso Ramfou was first published in Greek here.